A locomotive of the type used on early railroads. In the 19th– century, decades before the first airplane took to the skies, there were “air-line” railroads. The term, “air-line” was used to describe a route that ran fairly straight and flat in a more or less direct line from one point to another. In 1847, the Providence & Worcester Railroad began operation of such a line in Smithfield along the shore of the Blackstone River. It should be noted that before the division of Smithfield in 1871, the municipalities of Central Falls, Lincoln, North Smithfield, and Woonsocket south of the Blackstone River, were all part of the town of Smithfield. 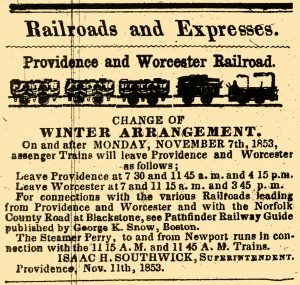 The idea of linking Providence and Woonsocket by rail was proposed as early as 1843. This was an era when roads between cities and towns were unpaved, unplowed, and usually poorly maintained. A rail line could provide a safer and faster means of travel, as well as a more economical and efficient way for mills and businesses to get their goods to market. But the rail proposal was only part of a grander plan, for it was hoped Woonsocket would become a railroad hub for southern New England. The railroad men envisioned a time when one could travel by train from New York to Boston, more economically, in less time, and without the dangers and discomforts associated with maritime or stage coach travel. On December 20, 1843, a meeting was held at the Woonsocket Hotel where local citizens gathered to discuss the plan. The meeting was a success, and several resolutions were drafted, all in favor of the railroad. The minutes were posted in the Woonsocket Weekly Patriot on December 22. However, seven days later the paper printed a letter penned by a person identified only as “J.C.M.”, who stated that such a railroad would hurt local businesses and decrease property values. As proof he cited the town of Dedham, Massachusetts, which he maintained had enjoyed economic prosperity before being connected to Boston by rail. 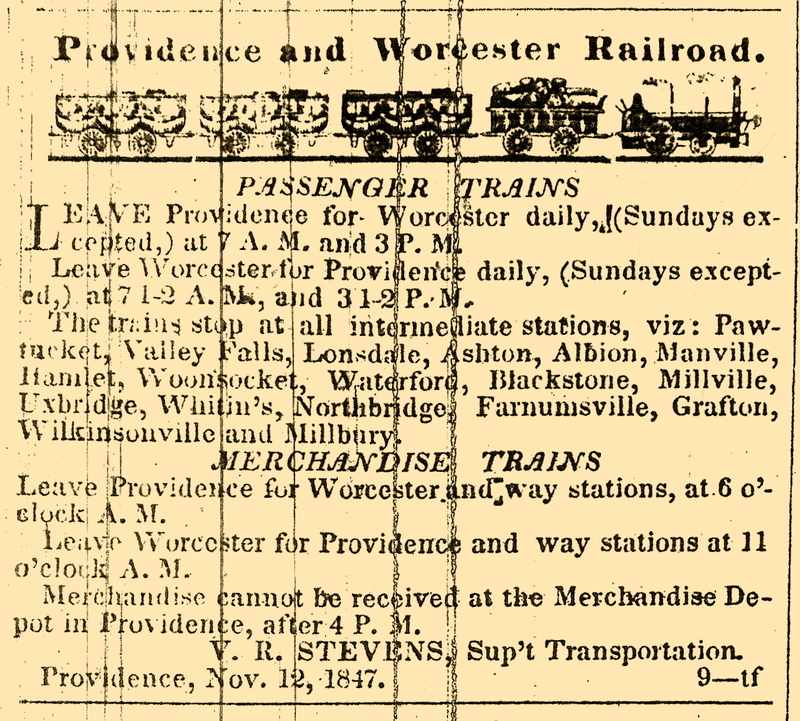 The letter stated in part: “The merchants, by moderate profits, could compete with the retailers of Boston – simply by reason of the high fare and tedious ride which customers must necessarily encounter going to Boston.” After the railroad was built, “Store after store closed for want of business.” In short, the railroad made it easer for shoppers to travel for bargains, and J.C.M feared the same would happen to Woonsocket. J.C.M. wasn’t the only voice of opposition. Stage coach lines and nautical companies weren’t anxious to compete with the railroads for freight and passengers, and then there were others who were attempting to establish new railroads of their own. Yet despite efforts to curtail the project, the “Air-Line” was finally approved, and surveyors laid out the intended route in 1844. Construction began in 1846, and the line opened for business on October 27, 1847. The first train to make the inaugural run from Providence was equipped with two locomotives to pull twenty cars which carried 1,500 passengers. Crowds gathered along the way, some firing salutes from pistols or small cannons. However, not all aspects of construction had been completed. The depots, for example, had yet to be finished, even though the trains were running, and certain portions of the route still needed upgrading. Yet the venture was so popular that it was reported there was more freight business than the railroad could presently handle. 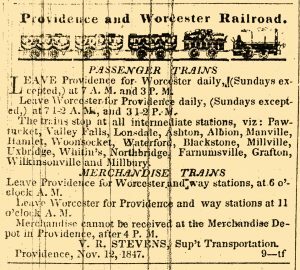 The tracks ran from Providence to Pawtucket, and then into Central Falls, which in 1847 was considered “downtown” Smithfield. From there the tracks led to Valley Falls, Lonsdale, and Ashton in the town of Cumberland, before crossing the Blackstone River and back into Smithfield at Albion. From there they led to Manville, Hamlet, and Bernon Village, before crossing the Blackstone again and entering the village of Woonsocket, From Depot Square they continued west crossing the river again back into Smithfield and Waterford Village before crossing the state line and continuing on to Worcester. Passenger trains ran every day except Sunday, beginning at 7 a.m. There were also special “merchandise trains” that began rolling at 6 a.m.
A special rail road stage line was begun to convey rail passengers to their final destinations not serviced by the railroad. 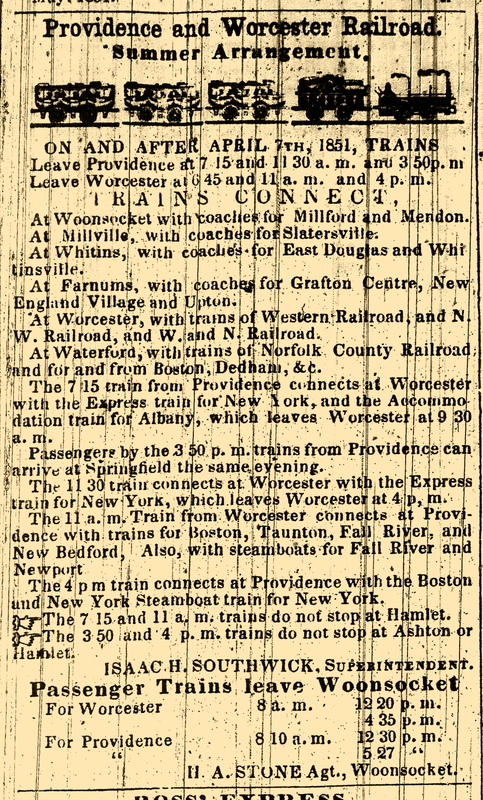 By 1851 passengers could make connections to express trains to cities like Hartford, Springfield, and New York. 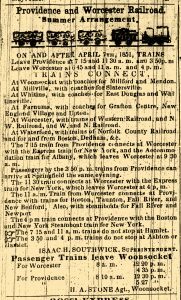 A rather bizarre and humorous tale relating to the new rail line occurred in April of 1855 when a man boarded a train in Rhode Island with a ticket to Worcester. For reasons unexplained, he refused to give it to the conductor so it could be cancelled. No amount of persuasion seemed to work, so when the train stopped at a Massachusetts depot, the conductor summoned a constable who brought along a Justice of the Peace. Why the man wasn’t immediately escorted off the train isn’t clear, but the decision was made to allow the train to resume its journey with all concerned still aboard. As the train moved along at 25 miles per hour, “court” was convened, during which the conductor stated his case, the J.P. issued a writ, and the constable served it. The passenger was found guilty and fined five dollars plus court costs which totaled nine dollars. He was then given the option of payment, or jail. He chose the latter! Another interesting tale relates how on December 3, 1857, an apple grower sent some product to market and was later undercharged on the freight bill. At the time he said nothing because some of the apples had been damaged in transit, but his conscience bothered him – for the next thirty-one years! In April of 1889 he was 70-years-old, and decided it was time to make amends before he met his maker. Going to the railroad office, he related the story, and offered to pay the bill with interest. The railroad official offered to compromise since the apples had been damaged by the railroad, but the man insisted on paying the whole amount. The original fee had been $16.50, but with thirty-one years of interest, the bill came to $47.19. Thus unburdened of his guilt, the man went away happy and relieved. There’s no doubt that the “Air-Line” helped Woonsocket to grow into the city it is today. Yet for all their benefits, early railroads lacked the electronic safety features we take for granted today, and sometimes accidents occurred. On August 12, 1853, two trains utilizing the air-line route collided head-on at Valley Falls killing thirteen people and severely injuring others. The wreck was initially blamed on a conductor named Putnam with only two weeks on the job, who hadn’t been properly instructed in his duties. This wreck, by the way, was the first railroad accident to ever be photographed. On July 21, 1855, a derailment occurred as a train approached the Woonsocket Depot sending passengers tumbling in all directions. Several were hurt, one seriously. A few days later on July 26, a train crashed into some boulders which had fallen on the tracks due to heavy rain just outside of Waterford. The train was wrecked in the subsequent derailment, but miraculously there were no serious injuries. Another serious derailment occurred on July 11, 1870 not far from the Albion depot, in which Jessie Annis, a brakeman was killed. On June 8, 1871, Conductor Bethuel A. Slocomb was killed when he fell beneath a train as it was leaving Woonsocket depot. On January 18, 1893, a horse-drawn sleigh carrying twenty-four people was struck broadside at the Lonsdale crossing. Eight people were killed and sixteen others seriously injured. An interesting article about a wreck that was averted appeared in The Providence Journal in December of 1879, and was subsequently picked up by newspapers around the country. The story related the strange experience of William D. Hilton, who worked in the freight department at the Providence station. On one particular night, (The date isn’t given.) a freight train was standing on the tracks, and a red lantern had been lit further up the way to indicate to the incoming express train that it was to stop and wait until the track was clear. About three minutes before the express was to arrive, an unseen voice said in an urgent tone, “Hilton, the light will go out!” Looking about, Hilton saw no one, but the mysterious voice repeated the warning. Without hesitation, Hilton grabbed a red lantern and began running along the tracks until he reached the red warning lantern, which he found to be working perfectly, but as he stood there catching his breath the lantern suddenly went out! Just then he saw the headlight of the approaching express train and began frantically waving his lantern. Fortunately the train’s engineer saw Hilton and his waving lantern and brought the train to a stop. Had it continued on it would have plowed into the standing freight train with disastrous results. Normally the express carried two passenger cars, but on this night it was pulling seven, and they were all full. Examination of the faulty signal lantern found nothing wrong with the wick or oil level, and why it went out could not be explained. To prevent a reoccurrence, three warning lanterns were hung in the future. Of course accidents weren’t limited to the Providence & Worcester line, for all railroads of the time experienced their share of mishaps. 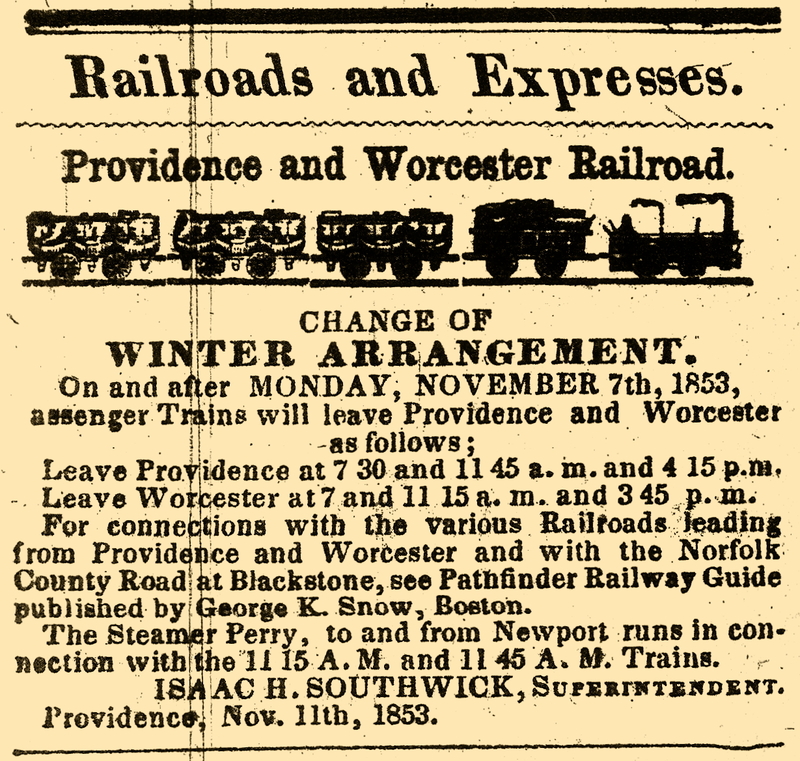 The “Air-Line” proved to be a great success and until January of 2017 was still operated by the Providence & Worcester Railroad. Today it’s managed by the Genesee & Wyoming Railroad.